Two-thirds of Mass Effect drove me crazy. The dull combat mooted the RPG elements and the side quests were a complete waste of time, and I wasn’t much of a fan of the way the characters were developed and revealed. On balance, I’d have to say I didn’t much care for it. But I’m never balanced in how I assess games. I have an Impressionist’s sensibilities. I play for those moments that arrive like a lightning flash, something so perfectly captured that it seems to exist apart from the rest of the experience. Everything else will fade and be forgotten, but this moment will linger on in the theater room of the mind. What I’ll carry away from Mass Effect are a few great conversations and a brilliant climax. The scene where Wrex has just discovered that the sterilization afflicting his people has been cured, but that stopping the villain requires destroying that cure, is excellent. 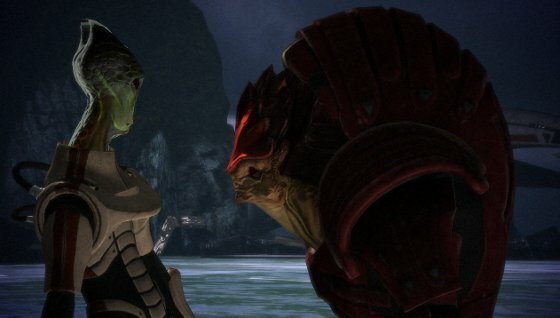 Wrex has always been matter-of-fact about his race’s slow slide into extinction, but when he comes face-to-face with the possibility that he could save them, he almost snaps. Another great moment in inter-species cooperation. The great part about the scene that follows is that Shepard is ostensibly talking Wrex down, but it would be closer to the truth to say that Wrex just admits what his heart already knows to be true. Wrex, it’s clear from his stories, plays the part of the simple Krogan barbarian, but is actually one of the most insightful characters in the game. He has overcome a genetic and cultural predisposition for aggression and faced up to why the Krogan have always partly been the authors of their own demise. He is an exile from his people because he has told them they must change, and they’re not ready to hear the message. So even though he snarls at Shepard that the lines are getting blurred, he ultimately knows they aren’t. He knows the Krogan are being rescued to serve as cannon fodder, and when Shepard says to him, “These aren’t your people,” the double-meaning is not lost on him. He agrees to help destroy the facility and the cure. The sequence on Ilos culminates brilliantly, and ultimately forms the heart of the game. Shepard and her crew are exploring the last ruins of the Prothean civilization, a race that ruled the galaxy for fifty thousand years earlier but who mysteriously died out. 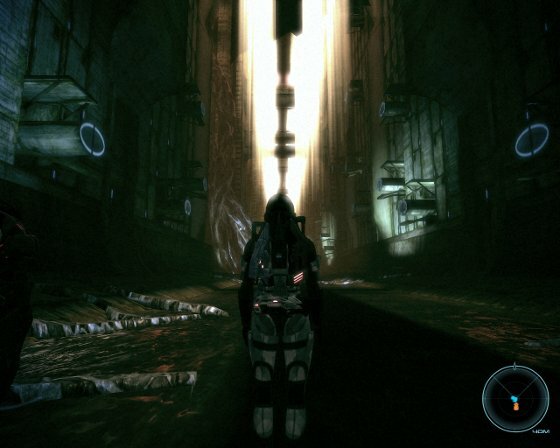 After brushing aside some Geth, Shepard and her compatriots take a long, eerie drive through the canals and canyons below the city. Along the way, Garrus realizes that the canyon walls are actually huge cryogenic storage banks, full of units that had been shut down for millenia, making the entire place an accidental mausoleum. Finally, Shepard comes to a Virtual Intelligence that the Protheans left behind. I’ve complained a lot about the way conversations work in this game, but this was one case where it felt absolutely natural. I sat, rapt with attention, as the VI told its story. 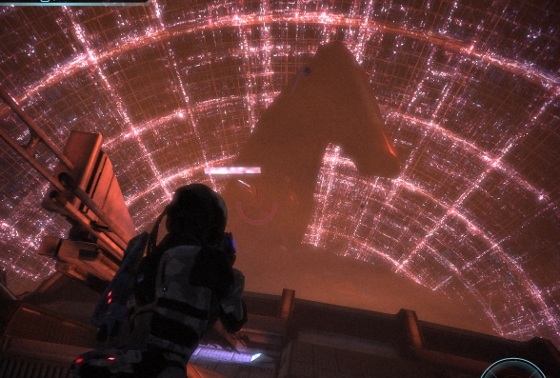 Beneath Mass Effect’s simple story of a galaxy at peril is a technological fable. “Mass Effect” refers to the technology that has brought every race into the interstellar age, the set of scientific and engineering principles upon which almost every contemporary technology rests. But of course, mass effect technologies have not been discovered, but found. Mass effect relays, point-to-point transit hubs strung throughout the galaxy, were not built by any of the galaxy’s races. They all credit the Protheans with having invented the technology, but there is growing evidence throughout the game that the Protheans also found the mass effect technology. The relays, and the super space-station that acts as the seat of galactic governance, the Citadel, seem to predate everything. They sit there, scattered around the galaxy, just waiting to be found. An early warning is sounded by an encounter with a salarian scientist aboard the Citadel. He is caught studying the Keepers, the insectoid servitors of the Citadel. They are seen everywhere, plugging away at tasks they’ve assigned themselves. The Citadel’s authorities have made it illegal to impede Keepers in the performance of their duties. But as the salarian points out, “We don’t know anything about them.” The Keepers are taken for granted, assumed to be benign, but are fundamentally a mystery. The encapsulates the relationship the sentient species of the galaxy have formed with mass effect technology. They found it waiting for them and used it without question, because it was convenient and because it was so far beyond their capacity to understand it that it became nothing more than useful magic. The other races endlessly remind the humans that they are newcomers on the galactic stage, but the irony of their pretensions is that their powers rest on an uncertain foundation. The salarians, asari, and turians pretend that they have created galactic governance, when the truth is that they were merely the first to locate its levers. 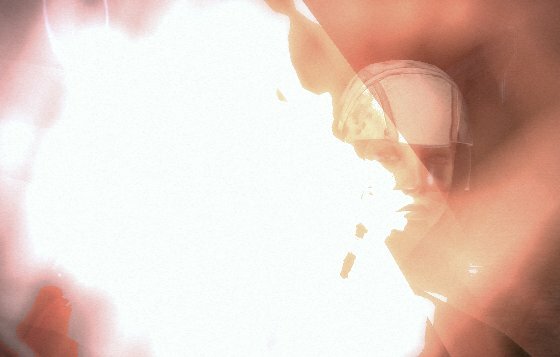 Shepard, listening to the VI hologram. The Prothean messenger explains that the Protheans followed the same development track. They mastered space flight, and then found the mass effect relays waiting for them in the darkness. They never realized, until it was far too late, that the technology had been left behind for a purpose. That the technology could serve the agenda of another power, and that their unquestioning reliance on the technology had effectively lobotomized them. Clarke reminds us that, “Any sufficiently advanced technology is indistinguishable from magic.” Mass Effect is about the danger of building a society and way of life around techno-sorcery. It’s about the hazards of accepting tools and conveniences without knowing where they come from, how they work, and what is their ultimate cost. Mass Effect is about life in an age of miracles, where the costs lurk somewhere out of sight, and the future belongs to technologies that are neither understood nor questioned.